Greenhouse farming is an intensive system of farming where a large number of crops are grown in a relatively small portion of land. It has been proven to be a sustainable system of farming where crops can be produced in adequate quantity and the right quality. Under this system, quality is placed as the topmost priority for greenhouse crops. 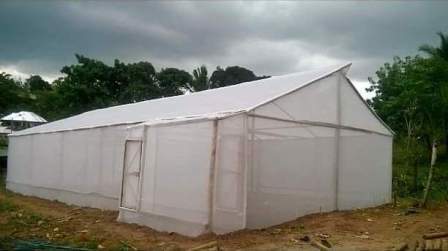 A greenhouse is a framed enclosure or structure, covered with transparent or translucent material, that provides an opportunity for the control of all environmental factors that are capable of affecting crop yield and wide enough to facilitate the performance of cultural practices to aid good crop growth and development. Why Do You Cultivate In A Greenhouse? The purpose or aim of planting in a greenhouse is to extend cropping season, allowing the plant to perform to their genetic potential, and to protect crops from adverse environmental conditions, thereby enhancing the quality of crop produced. In a greenhouse, crops are grown in either soil beds, conditioned with peat or organic manure, in benches, in pots or vessels containing soil or hydroponic system. Truth be told, greenhouse farming requires a high level of technology to achieve adequate economic returns on investment. The greenhouse for farming should be oriented in an east-west direction to maintain better sunlight level as compared to a north-south oriented one. This aids photosynthesis and good growth of crops, thus, allowing greenhouse farmer have good yield. The glasshouse is the oldest type of greenhouse, glass is used as the glazing material or film. It is very expensive, difficult to maintain and prone to fervent damage as a result of strong wind action. Polyhouse is a widely used type of greenhouse across the globe. It is made of the frame (usually metal) of the desired size and covered with polyethylene film. 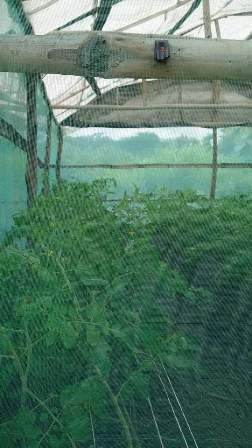 The net house is a simple type of greenhouse; here, a net is used as the glazing material, thereby, reducing the adverse effects of the sun and heavy rain. A net house is mostly used by greenhouse farmers for growing crops like vegetables, fruits, flowers, medicinal plants and in the nursery. The roof of a net house is covered with cladding materials like HDPE, which does not absorb moisture. Technically, a greenhouse is a frame-like structure usually made of metals of suitable size. The only varying material is the glazing material or film, used in covering the greenhouse. The cost, climatic and environmental condition usually determine the types of gazing material or film used in the greenhouse. 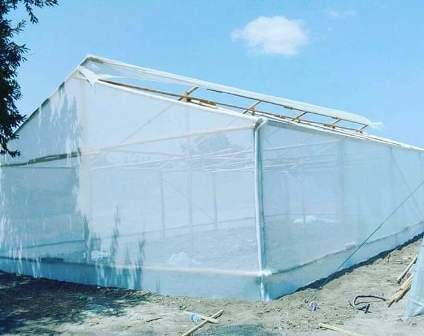 Basically, there are four (4) materials used in covering the greenhouse. The glass is universally the most preferred covering material for greenhouses because of its light transmissivity and good temperature retention. 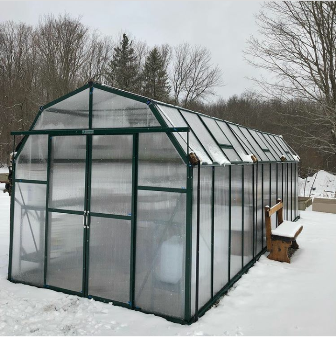 However, the high cost of installation, fervent damage, and poor maintenance are the liming factors in the use of glass as a film in greenhouses. Remember, glass is the most preferred but polyethylene is the widely used greenhouse film or covering material across the globe. Only a UV-stabilized polyethylene sheet is recommended because Non- UV polyethylene will breakdown after 3-5months due to photochemical reactions. Polyethylene film is tough, flexible and inexpensive. It can withstand as low as -50oC but melts at a temperature between 80-90oC; temperature above 60 oC will make it lose much of its strength and may stretch significantly. This type of glazing material is commonly used in areas of high intensity such as Southern USA. As this material gets aged, its transparency gets reduced due to yellowing. This is a modified material that is made up of double skinned sheets; it is stronger than other glazing materials but have a lower light transmissivity and it is quite expensive. These glazing materials have a service year of 2 – 20 years. Sunlight is essential for crop growth and development. It is the major source of energy used by plants and it is essential for photosynthesis. A greenhouse should be constructed such that it receives sunlight for maximum hours. In hilly regions, the greenhouse should face the south-east direction and it should not be located under shade. In the tropics, temperature retention should be reduced by choosing a less-sunny site. This is the amount of water present in the atmosphere. The minimum requirement of relative humidity to enhance the normal physiological function of the plants is 50 percent. In the greenhouse, adequate water application and restricted air circulation help maintain the relative humidity of the greenhouse. Plants need carbon-dioxide for the process of photosynthesis to make organic matter. In the cold arid regions, carbon-dioxide concentration is below normal and inside the greenhouse, it will drop further as a result of consumption by the plants. Supplementary application of carbon-dioxide will boost plant productivity in the greenhouse. In a hilly environment, appropriate air circulation is a better means of controlling the undesirable lowering of carbon-dioxide. A tightly closed greenhouse helps to conserve carbon-dioxide in the night. The soil is the most popular medium of plant growth. The best choice of soil in the greenhouse is the sandy loam soil enriched with decomposed farmyard manure, compost or biofertilizer to aid its productivity. The soil in the greenhouse needs to be treated through soil sterilization or soil solarization to prevent pathogen and pests within the soil. You can as well download the Greenhouse technology pdf if you care to have the written document. Greenhouse farming is a capital intensive and technological aided system of farming that ensures the regular production of the crop in the right quality and quantity. Greenhouse farmers enjoy all-year production of food in large quantity in a small portion of land. Remember to Share and Subscribe!